Manic Brothers – Exclusive mix for bejbi.se. The 28:th of our series of exclusive mixes..
Click ”see the rest of this entry” to read more about Manic Brothers and to download the mix. The Swedish twin duo of Manic Brothers, Niclas and Mats, started their musical journey in 2008 when they began exploring the electronic music scene. The brothers quickly found that their hearts belonged to techno/tech house and in 2009 they started producing their own music. 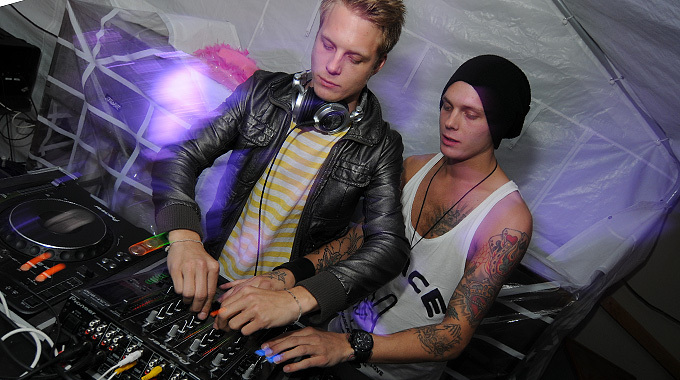 Since the start, Manic Brothers have played at many of Sweden’s leading techno events alongside well-renowned Dj’s Alan Fitzpatrick, Pär Grindvik, Nihad Tule, Nima Khak among others, and they are currently working on some upcoming releases for the end of 2010/the beginning of 2011. Manic Brothers have incorporated many of today’s techno influences into their style of and their sound, wich is characterized by its heavy and driven beats, is inspired by artists from the international scene such as Adam Beyer, Joel Mull, Speedy J, Chris Liebing, Sasha Carassi, Kaiserdisco, Nic Fanciulli, Reset Robot etc. Now they are the 28:th out for a series of exclusive mixes recorded for bejbi.se by our favorite dj´s, both well known, and unknown, that we will publish once a week untill we run dry. Download Manic Brothers Exclusive mix here (right click and save as) or listen to it live on Soundcloud or just press play below here. If you want more of Manic Brothers, check out their Soundcloud soundcloud.com/manicbrothers or their Facebook group for more info.